Prof. Alison Duncan, Department of Human Health and Nutritional Sciences, and Dan Ramdath of Agriculture and Agri-Food Canada, found that swapping out half of a portion of these starchy side dishes for lentils can significantly improve your body's response to the carbohydrates. 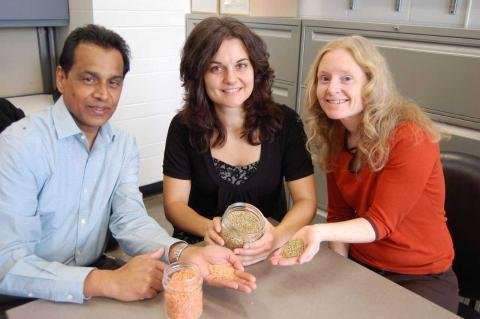 "Pulses are extremely nutrient-dense food that have the potential to reduce chronic diseases associated with mismanaged glucose levels," said Duncan, who worked on the study with Ph.D. student Dita Moravek and M.Sc. students Erica Rogers, Sarah Turkstra and Jessica Wilson. "Canada has a huge production of lentils, but we export most of it and only 13 per cent of Canadians eat them on any given day," said Duncan. "We are hoping this research will make people more aware of the health benefits of eating pulses." Researchers measured glucose levels in the participants' blood before they ate and during two hours afterward. They repeated the process for white potatoes alone and the same combinations of potatoes and lentils. "We mixed the lentils in with the potatoes and rice because people don't typically eat pulses on their own, but rather consume them in combination with other starches as part of a larger meal, so we wanted the results to reflect that." "This slower absorption means you don't experience a spike in glucose. Having high levels over a period of time can lead to mismanagement of blood glucose, which is the hallmark of Type 2 diabetes. Essentially, eating lentils can lower that risk." "We are hoping that building evidence for approval of a health claim for pulses will further encourage people to add pulses to their side dishes."